RANGELY | A lively crowd gathered for the 14th annual Colorado Northwestern Community College (CNCC) Foundation Dinner March 31 in Rangely. 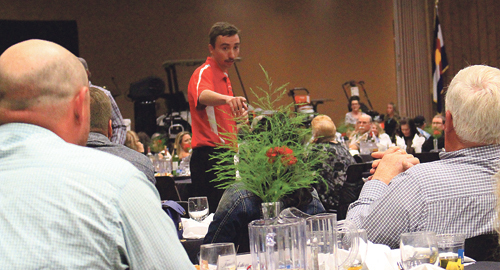 The yearly event raises funds to support scholarships for CNCC students. This year’s total reached over $70,000 which exceeds past successes by some $20,000. As guests arrived, they browsed the many silent auction offerings and chatted with friends. CNCC’s Flight Team provided table service throughout the night. Chevron’s Michael Haub kicked off the evening’s fund-raising by presenting a check to CNCC President Ron Granger for $19,000. Chevron expressed particular interest in students entering STEM (science, technology, engineering and mathematics) fields. Chevron’s generosity set the tone for the night. After a delicious brisket dinner supplied by the College’s Sodexo food service, with cheesecake for dessert, CNCC rodeo coach, Jed Moore, led the live auction. Moore gave a quick lesson on auction spotting to his assistants from the Flight team, who responded with varied degrees of enthusiasm and some of whom had apparently never previously witnessed a live auction. 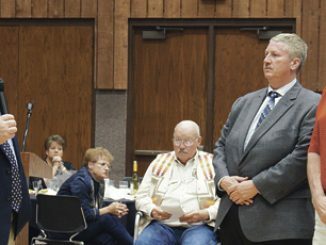 When county commissioner Jeff Rector jumped in, the night was off and running. Moore’s humor and energy drove the live auction through to the end and kept the audience in stitches. Donors of items for the silent and live auctions and/or cash included: Alisa Granger Photography, Alliance Energy Company, Argali, Bank of the San Juans, Big D’s, Matthew & Konnie Billgren, Blue Mountain Inn & Suites, Blue Mountain Energy, Blue Spruce Inn Meeker, Shawn Bolton, Bo + Nae Dog Biscuit Company, Paul Burgell, Chevron, Cimarron Telecommunications, ColoCPA Services, PC, CNCC Aviation/NIFA Team, CNCC Bookstore, CNCC President’s Office, Doubletree Hotel Grand Junction, Duco, Ducey Electric, Elk Mountain Inn Meeker, Enstrom Candies, EZ Auto, Giovanni’s Italian Grill, Grand Junction Rockies, Grand Vista Hotel Grand Junction, Holiday Inn /Suites Downtown Grand Junction, Holiday Inn & Suites Airport Grand Junction, Home Loan Investment and Bank, Jane Hume, Laurie Alison’s Pantry, Meeker General Mercantile, Meeker Golf Course, Meeker Sand & Gravel, Moon Lake Electric, Nichols Store, Wendy Peterson, Brian Prater, Professional Touch, Rangely Auto Parts, Rangely Conoco, Rangely NAPA Auto, Rangely Trash, Rangely True Value, Rick and Ann Brady, Rio Blanco Herald Times, RB Water Conservation District, Rocky Mountain Well Service, Kayla Rose, Keri Rusthoi, Sue Samaniego, Silver Sage RV Park, Diane Sizemore, State Farm—Kevin Amack, Kyle Stewart, Jay Sullivan Art, Summit, Sweetbriar, Sam Tolley and Lonnie LeBleu, Town of Rangely, Pat and Niki Turner, Urie Rock Company, Utah Gas Corp., W.C. Striegel, Wendll’s of Meeker, Western Rio Blanco Metropolitan Rec. Dist., White River Inn Meeker, White River Market, Barbara Widner, Michael Widner, Lindsey Wiley and the Wyman Living History Museum. The foundation very much appreciates all who donated, attended or in any way contributed to the CNCC Dinner. Special appreciation is due Rangely Mayor, Ann Brady, chair of the foundation board, for being a primary workhorse behind the scene. For more information on the Foundation, contact Sue Samaniego at 970-675-3216 or sue.samaniego@cncc.edu. RANGELY | The Colorado Northwestern Community College Foundation will hold its annual dinner dance Saturday at 6 p.m. in the Weiss Colorado Room on the Rangely campus.